↑ Lovari, S., Herrero. J., Conroy, J., Maran, T., Giannatos, G., Stubbe, M., Aulagnier, S., Jdeidi, T., Masseti, M. Nader, I., de Smet, K. & Cuzin, F. (2008). 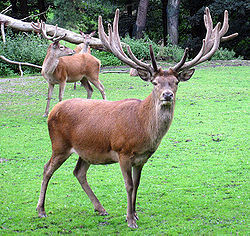 Cervus elaphus. In: IUCN 2008. IUCN Red List of Threatened Species. Downloaded on 5 April 2009. Database entry includes a brief justification of why this species is of least concern. หน้านี้แก้ไขล่าสุดเมื่อวันที่ 7 มีนาคม 2558 เวลา 08:19 น.